Just a search on the web will get you many recipes to enjoy but the following ones are those that we have made and enjoyed and can therefore recommend to you. One of our favourite sites for recipe ideas is the BBC Food site and another one we've found is that of the Good Food Magazine. Just click on the following items for each section or recipe. 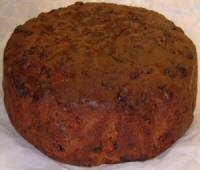 Christmas Cake - An old recipe handed down over generations! Have you ever tried Savoury Egg on toast, or do you in fact know what Savoury Egg is? For those of you that are health conscious you might like to read the Top 100 foods for Health. There's some interesting facts in there about food and it's effects on the body and mind. Well worth a read! Mix flour, butter, sugar and eggs together in bowl. Add mixed spice and treacle and continue to mix. Once cooled you can add brandy or any other alcohol to suit yourself in the usual manner. Add marzipan and/or icing to suit although we prefer to put nuts and fruit on the top and forego the marzipan etc. We are also going to experiment with less sugar and maybe substitute the butter for a lower saturated fat alternative, in order for it to become a more healthy option! Preparation time: less than 30 mins. Cooking time 30 mins to 1 hour. Sieve flour, ginger and bicarbonate in a bowl. Place margarine, syrup, treacle, sugar and water in a pan. Gently heat until melted. Add dry ingredients, beat well then add beaten egg. The mixture looks very watery, but it will be ok.
Pour into a 23cm/9in tin and cook at 190C/375F/Gas 5 for 50-60 minutes. A nice little extra is to use some real Ginger, finely chopped and mixed in! Beautiful! Warning! Don't chop too small if using a food processor or you won't find it in the cake!! When one was first offered this teacake with a glass of Spanish sherry, it seemed just right. Made with olive oil, it is a cake you can prepare easily by hand or in a food processor. Set oven temperature to 180°C/350°F, Gas Mark 4. Grease a 20 to 23cm/8 to 9 inch plain or fluted round cake tin and line the base with greased greaseproof [waxed] paper. Sift the flour into a large bowl and stir in the sugar and seeds. Gradually beat in the eggs, milk and olive oil, beating until well combined. Pour into prepared tin and bake in a moderate oven for 1½ hours or until a fine skewer inserted in the centre comes out clean. Makes one 20 or 23 cm (8 or 9 inch) cake. Have all ingredients measured and assembled nearby (the mixing takes literally 1 minute). Put the flour and sugar in the bowl fitted with the blade and combine. Add the eggs, milk, olive oil, and lastly the seeds and mix until just combined. Tip: I usually grind some or all of the seeds to impart additional taste! Cut the butter into rough cubes, and place into the processor bowl fitted with steel blade. Add sugar and mix for approximately 45 seconds on high speed, until light and fluffy, scraping down the bowl several times as necessary. Add the eggs one at a time scraping down after each addition. Add the sieved flour, spice and milk and pulse until the ingredients are just incorporated. Add the fruit and mix again until just incorporated. Take care not to over mix the ingredients as the fruit might become chopped. Turn into a greased and lined 7" (17.5cm) cake tin and bake in a pre heated oven at 150°C, 300°F, Gas Mark 2, for approximately 2 hrs or until cooked. Again, I like to warm the fruit before hand in either brandy or more recently, Cointreau! Try it yourself, it’s very nice! Traditionally, you would use a bakestone or a heavy iron griddle, but a good frying pan will suffice. (Some cookers, such as ceramic tops, don't readily take the traditional iron griddle hence the frying pan substitution!) Rub the surface with butter and wipe off any excess. Put it on to a direct heat and wait until it heats up, place the Welsh cakes on the griddle, turning once. They need about 2-3 minutes each side. Each side needs to be caramel brown before turning although some people like them almost burnt. Heat oven to 180°C/350°F/Gas Mark 4. Grease and flour 2*1 lb loaf tins. Put fruit, butter and water in a saucepan, bring to the boil and then simmer for 5 mins. Allow to cool a little. In a mixing bowl, sift the flour, bicarbonate of soda and salt, and then stir in the sugar. Pour in warm fruit mixture, add the beaten eggs, the malt extract and mix well. and bake for a further 30 mins or until the skewer comes out clean. Cool for 5 mins and eat warm with butter! Equally nice cold with or without butter! - Ed! Note! I like to put some brandy in with the fruit and warm it thru before adding to the mix! Cream the butter and sugar until white and fluffy. Sieve the dry ingredients and gradually add to the creamed mixture. Press into a 12" x 8" tin. Smooth over the top, mark into fingers and prick with a fork. Bake in a slow oven @ 325�F, 160/170°C, Gas Mark 3, for 30-40 minutes. Re-cut the fingers and dredge with castor sugar while still hot. Leave until cold and remove from the tin. Preheat the oven to 190°C/375°F/Gas 5. Place the chicken breasts in a shallow roasting tin and set aside. Heat the oil in a small pan, and fry the spring onions and garlic for 2 minutes until softened. Add the clear honey, orange juice, orange segments and soy sauce to the pan, stirring well until the honey has dissolved. Pour over the chicken and bake, uncovered, for about 45 minutes, basting with the honey glaze once or twice until the chicken is cooked. Garnish with the lemon balm or parsley and serve the chicken and it’s sauce with baked potatoes and a salad. Fry the onion in a little oil, until transparent. Add the carrot, mushroom, pepper and garlic and cook for 4-5 minutes. Add the rice and chilli, and stir. Add the stock and wine and simmer until all liquid has been absorbed. Cook the pork in a large heavy-based saucepan for about 7 minutes until it is crisp and golden. Using a slotted spoon, remove the meat to a plate. Add the chicken livers and gizzards and cook, stirring occasionally, for about 5 minutes until tender and lightly golden. Transfer to the plate of port. Add the onion, celery and pepper to the pan and cook for about 6 minutes, stirring frequently, until the veg is tender. Stir in the garlic, cumin and hot pepper sauce and cook for a further 30 seconds. Add the rice and cook, stirring, until translucent and well coated with the fat. Add the stock and season with salt and pepper. Return the cooked bacon, chicken livers and gizzards to the pan, stirring to blend. Cover and simmer gently for 20 minutes until the rice is tender and the liquid absorbed. Serve this on toast or on a plate along with the bacon, sausage, mushrooms, fried bread (fried in Olive Oil of course! ), etc. 1 tin of tomatoes, peeled plum in preference, although you could use chopped ordinary or with herbs - all a personal preference. Empty the tin of tomatoes into a saucepan and chop them through whilst heating gently. Once the tomatoes are softened and chopped - potato masher does a good job here! - add the beaten eggs and stir continuously until the mix starts to thicken. Serve on freshly toasted bread for a delicious snack or add as part of a cooked breakfast.